If the labour market lagged the rest of the economy, as it usually does, then Australian labour data should continue to be picking up. But the March labour data were distinctly unimpressive and have us worried that this may be reflected in other demand sensitive areas of the economy...retail sales, business investment, confidence etc. The figures are, as ever, a complicated combination of full-time and part-time jobs. 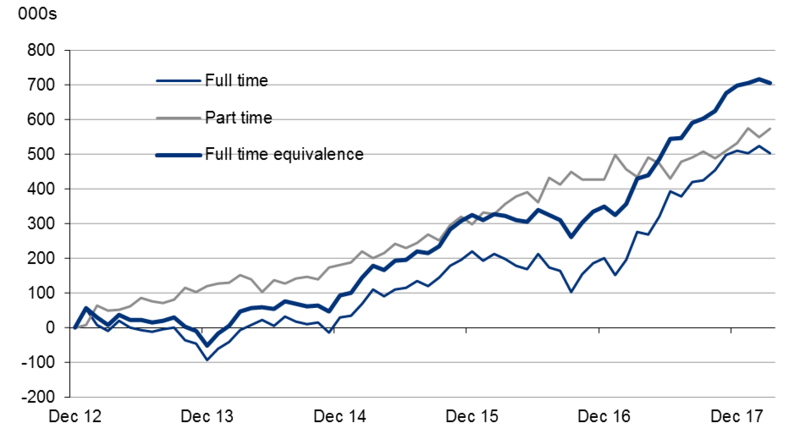 In March, full-time job falls were more than offset by part-time jobs, though a full-time equivalent series we have created shows employment lower than it was in January. Downward revisions have further weakened the picture painted by these data. Moreover, the only bright spot in the data, the fall in the unemployment rate, seems to owe as much to a drop in labour participation rate than to anything positive. Such a fall is usually driven by falling optimism or a declining reward for working...not very positive in any case. But as mentioned, the labour market should follow the rest of the economy, and purchasing manager indices, on a composite basis are positive, though have fallen recently for manufacturing. This might explain some of the full-time / part-time split, as part-time jobs are more likely in services. Wages are also generally poorer in the service industry, so that may weigh on the Reserve Bank, although they show few signs of any tightening bias currently. We have a tentative 4Q18 rate hike pencilled in, but have the eraser ready to hand in case we need to shift it back.